growers do not have a frost alarm. growers are starting their protection system, based on a dry temperature. the frost alarm is not placed in the right place. the temperature sensor is installed too high. When it comes to frost protection, there is only one important temperature: the wet temperature. Using a dry temperature meter is one of the biggest mistakes you can make. Therefore, it’s crucial to have a good alarm system that tells you when to start, based on the wet temperature. Because most systems use a dry temperature sensor, we decided to develop our own Frost Alarm. This new device is only for frost warning. Our goal was to make a reliable alarm that is very easy to install and that works on the wet temperature. It’s powered by a 12 or 24 Volt battery (not included). It works with a SIM-card (also not included) so you need mobile network coverage. You can send SMS warning messages to maximum 3 mobile phones. It’s also possible to interrogate the station by sending a text message. The station will send you back all data: wet and dry temperature, relative humidity, dew point, battery voltage and alarm temperature. When te set temperature is reached, it sends an alarm message to the phone numbers that are saved in the system. It will also send a message when the battery voltage becomes too low. It comes with a inox pole. no alarm is so easy to start up. alarm is based on the wet temperature. possibility to send a text message to 3 mobile phones. possibility to send a text message to the alarm. 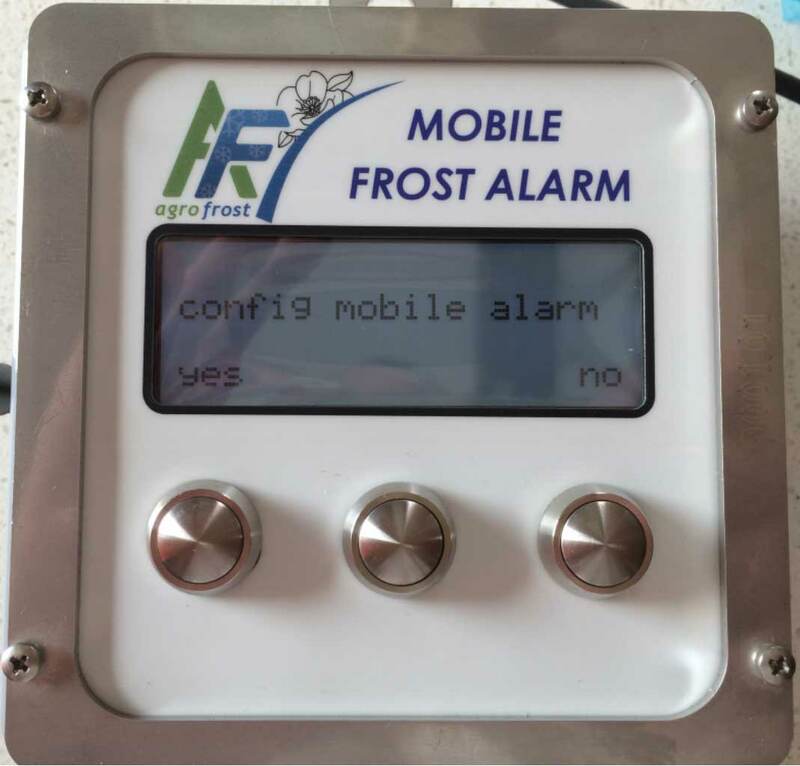 The alarm will respond with a text message that includes all data: wet temperature, dry temperature, humidity, voltage of battery, wind speed, installed alarm temperature. sensor with a precision of 0,1 °C for maximum precision. delivered with adjustable inox support. place the alarm in the orchard or vineyard that you want to protect. place the alarm in the lowest (=coldest) spot of the field. if you have several fields, use one alarm for each field. the sensor must be placed at the same height as the lowest flowers/buds. Use the link below to connect with the Fieldclimate database.